John Mytton had several grooms with designated occupations. One had the unlikely name of Tinkler–his “home stud” groom. Tinkler’s job was to oversee his master’s race horse breeding operations. Nimrod reports this employee was of the “old sort,” a “careful nurser of young racing stock.” Mytton was quite in charity with this thinking, not wanting his young stock to be raced too soon. Unfortunately, when other horsemen pushed their young colts and fillies to the track early, Mytton’s stock hadn’t a chance. “Too fond of green meat,” they said of the groom, and the master. Thank heavens for that little grocery in Staines! Mytton, in contrast to the elegant Mr. Beaumaris, is a rake. He cares not what society thinks of the state of his Hessians. Which is why he elevated a stable-boy to the rank of valet. It was perhaps an unlucky thing for the boy, who was with Mytton when his four-in-hand, by mistake, turned down a closed road and crashed into a barrier. 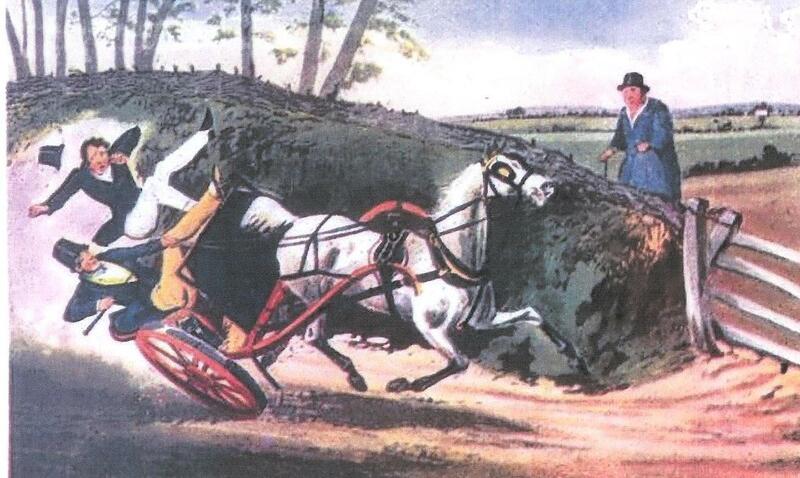 The valet, riding in the coach with his master, suffered serious injuries. Mytton, as was usually case, came out without a scratch. In the midst of so much carelessness in Mytton’s service, some fraud was bound to occur. Nimrod was astonished to see a favored servant of Mytton’s roaming aimlessly in Shrewsbury. “I have left Mr. Mytton’s service,” said the man. “How so?” observed I, with surprise, knowing him to have been a favourite servant. Apparently said employee had been induced to change the veterinarian’s bill (is that so wrong?) to pocket the extra change from Mytton’s ever-ready and generous hand. And so he might have gotten away with it but for our man Longueville who discovered the discrepancy. It was Nimrod who interceded for the servant, having always demonstrated good character during his service with a Shrewsbury clergyman. Mytton, in typical fashion, forgave his servant and kicked him back in the servants’ hall with an order to put on his livery. 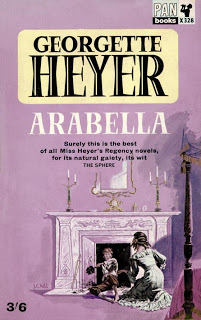 This entry was posted in Regency, Uncategorized and tagged Arabella, Beaumaris, Georgette Heyer, John Mytton, Longeuville, Nimrod, Painswick by Angelyn. Bookmark the permalink. It is hard to think one would have so many servants. They were necessary to run big estates. Imagine trying to keep up with all those people! Good post. And to think he had rather less at Halston than other great country estates. Thanks for always visiting! I have to like someone who wanted to protect his young horses from being raced too soon. Yes–I’m quite in agreement. Youngsters had to have those cannon bones blistered and other obnoxious cures administered. Mytton had the right of it with his horses, I should say. He sounds like a good master and horse owner. A shame he wasn’t a better husband to his wife and property. But really, Angelyn, Robert Beaumaris would be shocked to have been included in company with Mytton! Oh, Beaumaris would have given Mytton the cut direct if he had the chance. But then, Baumaris was not a rake, as far as society was concerned. Good to see you!